Collaborate with all members of your team in one convenient place. When you have multiple team members working on the same account, they may not need full access to everything. ZipBooks can help you control which team members can see what with this feature. Designate who has access to tracking time, project management for a certain customer, accounting, reporting, or invoicing so you can keep your ship running smoothly. Invite team members to participate in different ways on diverse projects. Whether your collaborators are contractors, accountants, or other employees, you may give them permission to access things like invoicing and billing, reports, or time tracking. 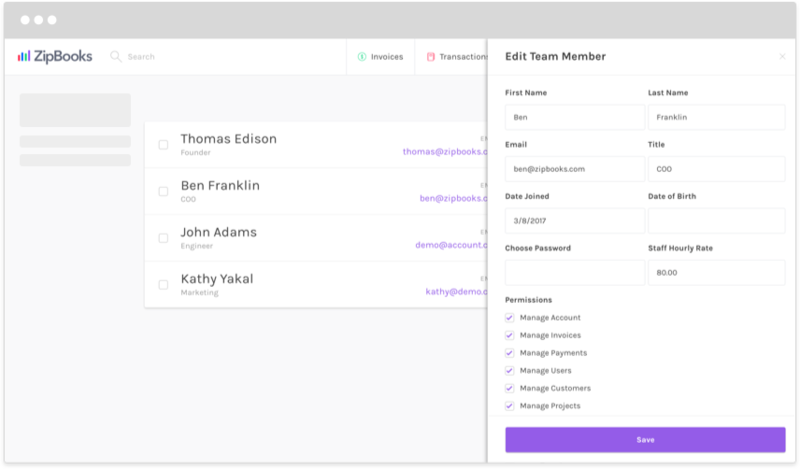 Once you’re ready to bill a customer, pull all applicable data from each team member onto your invoice seamlessly and with no additional hassle.